One reading habit I have tried to maintain is to read through a “daily” reading book each year. This is the second book in this series that I’ve read and have enjoyed them both (the first being the Early Church Fathers). Jonathan Edwards may be hard enough for someone to read, especially from his theology works. 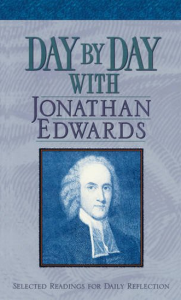 This volume gives you a one-page daily reading from a variety of Edwards’ works. Each selection is referenced so you can go to the original source if you chose. Edwards (1703-1758) is important as a leader in the Great Awakening, a Puritan pastor, an educator (President of Princeton College) and America’s foremost theologian. This volume allows even the most casual reader the exposure to Edwards and also daily refreshment from a well that was deep.